Monte Labro (1,193m) is clearly visible from Podere Sant’Angelo. There are great views from here west across to Corsica and Elba, north to Siena and east to Monte Amiata. This walk starts in the Parco Faunistico. To get there take the road to Arcidosso, after about 6km take the left turning and follow the signs for the Parco Faunistico. The path to Monte Labbro starts in front of the park’s cafe. 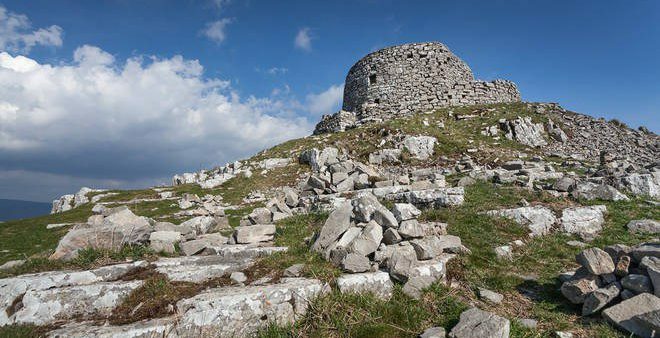 To return I suggest you walk down to the car park below Monte Labbro and follow the unmade roads back to the Parco Faunistico. This walk takes about 3 hours. For a longer walk start from Merigar, the buddhist monastery. Leave your car here and follow the unmade road that heads north. After a couple of kilometers you join the road that leads to the Parco Faunistico. The Tibetan style buildings and sculptures around the Merigar complex are worth visiting as is the small shop in the information centre. Leaving Podere Sant’Angelo you turn left and after about 15 minutes (you see a map of the local paths) turn left into the forest along a marked track. As you walk through the forest we navigate around the mudbaths frequented by the local wild boar. When you reach Triana (after about 40 minutes) the first sight that impresses is Triana castle (Castello di Triana) which dates back to 776 in documents of the San Salvatore Abbey. In 1388 it was turned over to the Piccolomini of Siena until 1962. For six centuries the Piccolomini owned all the land around as far as the eye can see. Unfortunately at the moment it’s not possible to visit the castle. The walk to Roccalbegna takes about an hour, depending on how often you stop and look at all the wonderful flowers. You turn right as you leave the garden of Podere Sant Angelo. Walk down hill for about 300m and take the first road on the right. This road goes down to the bottom of the valley. There’s a ford at the bottom. There may be some water here! 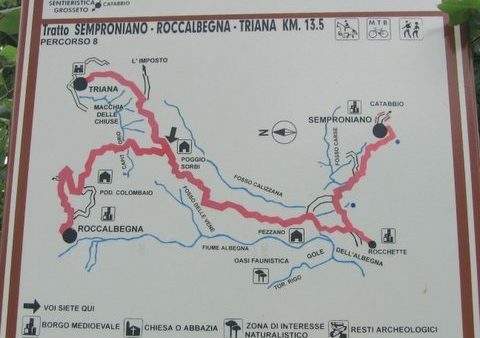 Remember that Roccalbegna is quite high which means you will be going uphill for most of the second part. Places to visit: • Ss. Pietro e Paolo, Romanic church from the 1200s, it has a beautiful, recently restored triptych of the Senese school • the Rocca, the pinnacle of rock that towers above the village, there are wonderful views from here down the Albegna valley to the sea • the Cassero, the Senese fortification opposite the Rocca, again there are wonderful views from here • a wander around the lanes of the village In Roccalbegna you can also do some shopping. The one shop not to miss is the butcher’s. Try his delicious sausages and the ricotta cheese. Siena is a lovely example of a medieval city with the famous ‘Campo’ at its centre, where the ‘Palio’ horse race takes place. I suggest calling in to the ‘Il Doccio’ bar on the way to the city to try one of the best porchetta rolls in Tuscany. Once at Siena head for the ‘Campo’ car park for reasonably priced parking near the centre. Podere Sant’Angelo is about 1.25 hours drive from Siena. This lovely classic Renaissance garden was created in the late 16th century during rebuilding works after the damage caused to San Quirico by the war between Siena and Florence. Geometric box hedges merge into wilder home oak woods. 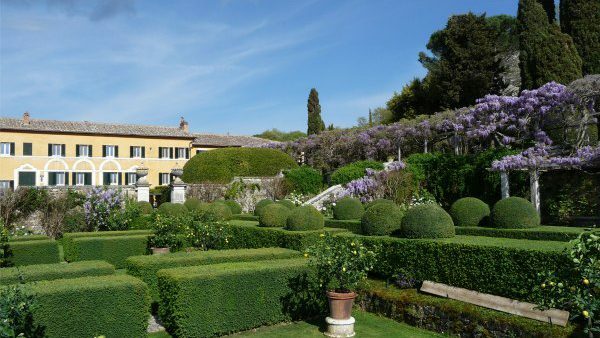 For garden lovers I recommend a visit to La Foce east of Monte Amiata. The garden here was designed in the 1930s for the Origo family by the English landscape gardener Cecil Pinsent. It is a mix of formal Italian style with box hedges and lemon trees and informal English style that blends into the surrounding countryside. There are spectacular views across the Val d’Orcia to Monte Amiata. When in flower (early spring) the over 100m long wisteria vine is a wonderful spectacle. From spring to autumn the garden is open on Wednesday afternoons. A new car park just off the autostrada at Villa Costanza has made day trips to Florence easier. The parking costs €4.00 for 8 hours and it’s located at the end of the tram line into the centre (€1.20, 20 minutes). What’s more, there’s a fantastic bar near the car park. Podere Sant’Angelo is about 2.5 hours drive from Florence.